Group Five’s Social Economic Development (SED) strategy is about empowering communities in our project catchment areas with resources, support and skills that ultimately lead to better lives. Our aim is to become a benchmark of effective SED within the construction industry by ensuring impact and sustainability of community initiatives. The impact we make on empowerment of communities is immense and goes beyond the borders of South Africa to the rest of the African continent where we operate. Group Five sponsors a number of mobile laboratories for under-privileged schools across the country under the auspices of Technology Research Activity Centre (TRAC) South Africa mobile laboratories. The programme seeks to enable and encourage learners to enter into careers in science, engineering and technology. 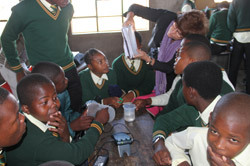 Technology Research Activity Centre South Africa is a national, non-profit organisation under the University of Stellenbosch and supports science and technology education in South African secondary schools. Wherever we operate as a group we ensure that we support the communities within the vicinity of our construction projects. During the construction of Tswane House in Pretoria, Group Five partnered with the Mthethwa Foundation on the Adopt-a-School Ablution Block Upgrade Project. The beneficiaries of this initiative were the Mothlana and Bula-dikgoro Primary Schools. The state of the ablution facilities at both schools was abysmal and posed potential harm to the health of the educators and learners. Unemployment remains one of the biggest challenges facing South Africa, particularly in marginalised communities where people lack the skills necessary to access job opportunities. Wherever a construction project is begun, many unemployed and unskilled members of the community assemble at the gate seeking employment. 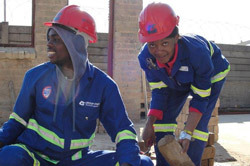 The "People at the Gate" programme is aimed at providing accredited basic construction skills training to unemployed job seekers arriving at the group’s construction sites, with the aim of employing them on projects or elsewhere where their skills can be utilised. Since the programme inception in 2006, 2177 people have been trained and 93% secured jobs. 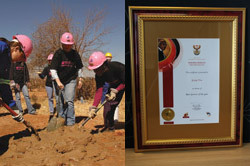 Women’s Build is an annual initiative implemented under the auspices of the Department of Human Settlements, which entails the construction of residential units for vulnerable and marginalised groups, particularly women. 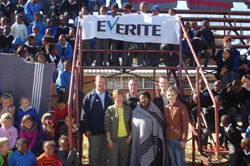 Group Five’s wholly owned subsidiary, Everite, has been involved in this initiative since its inception in 2005, through the sponsorship and installation of ceiling boards on houses built as part of this initiative. Group Five women actively participate in this programme through volunteering their time and skills to build the houses. 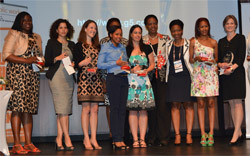 At the 2014 Human Settlement Govan Mbeki Awards, Group Five was recognized as “The Best Sponsor of the year” by Honorable Minister of Human Settlements, Lindiwe Sisulu. As the need for engineering professionals grows, Group Five endeavours to attract and retain women to the industry by creating a meaningful opportunity for women in what is traditionally a male-dominated industry. 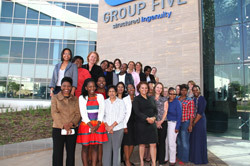 As a key player in the engineering and built environment, Group Five is the main sponsor of the University of Johannesburg Women in Engineering and Built Environment (WiEBE) Programme which is aimed at attracting and supporting women to be able to pursue careers in the engineering and the built environment disciplines. The Future of the African Daughter project (FOTAD) is a girl-child development project for girls aged 12 to 19 years who come from previously disadvantaged areas. 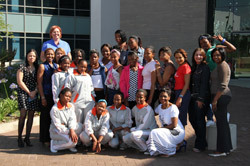 The partnership between Group Five and FOTAD was established in 2013 and since then various interventions have been undertaken which serve to provide practical and meaningful assistance, guidance and skills but mostly expose the girls to the world of work in the engineering and built environment sector. The Blanket Drive Challenge is an annual employee initiative that was launched in 2010 with the aim of helping homeless and needy people during winter. In the first year, over 800 blankets were donated by Group Five employees. The initiative has grown in leaps and bounds with over 12,000 blankets collected todate. It has become a great employee engagement tool as various business units compete against each other to collect the highest number of blankets. The apex of the drive is the prize giving ceremony where the CEO gives awards to the top three businesses that collect the highest number of blankets. The International Nelson Mandela Day is one of the important days on Group Five’s community calendar. Our employees get involved in various initiatives to help the needy in communities for at least 67 minutes. 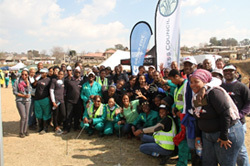 Among the numerous initiatives undertaken by the Group in 2016 was the partnership with the Black Business Council in the Built Environment (BBCBE) and the Department of Water and Sanitation (DWS) in support of their environmental initiative - Clear River Campaign; an initiative which entailed the cleaning of litter in the Jukskei River. Additionally, clothes were donated to the needy people of Alexandra. Group Five is actively leading the way in addressing the gender imbalance in the construction industry; an industry that is currently male dominated. This is done through a number of programmes that nurture and support young and established female talent with the aim of attracting them into the sector and retaining them. 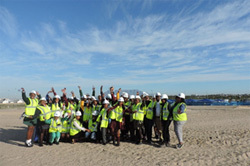 In 2016 Group Five partnered with the National Empowerment Fund (NEF) to expose 30 learner girls from Johannesburg to our Table Bay Mall construction site in Cape Town. The learners were able to get a “hands-on” feel of a day in the life of a construction worker which also involved briefing sessions on various operational site procedures and activities facilitated by our technical and safety personnel. 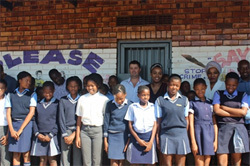 The Group Five Basadi Programme was launched in May 2011 and focuses on the empowerment of women, as part of the group’s transformation strategy. The programme’s overarching aim is to position Group Five as a truly transformed organization, and to enhance the company’s ability to attract and retain female talent through targeted training and development, mentorship, networking, and other relevant initiatives. 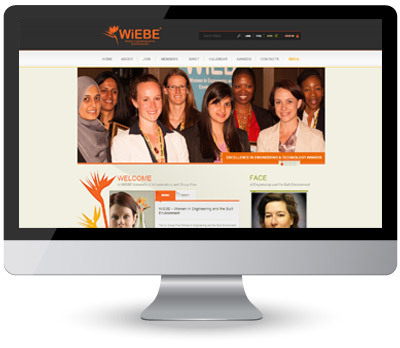 The programme seeks to promote gender equality and culture change within the group in order to make it a compelling workplace for diverse talent.